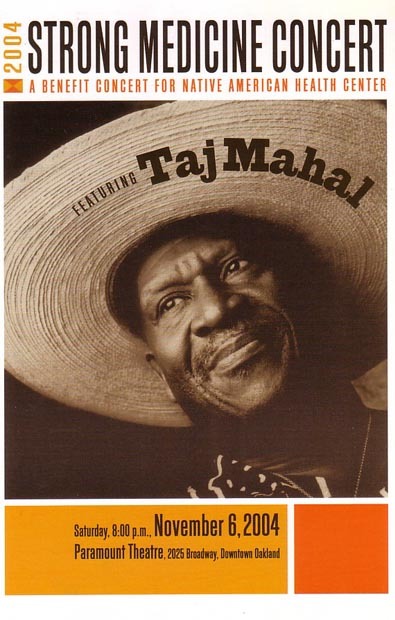 Strong Medicine Concert 2004: A Benefit Concert for the Native American Health Center featuring Blues legend Taj Mahal on Saturday, November 6 at The Paramount Theatre in Oakland. Tickets are available from the Paramount Theatre Box Office or Ticketmaster. Proceeds to benefit construction of a new health care facility. For more information, contact www.nativehealth.org. This entry was posted on Saturday, October 30th, 2004 at 3:18 pm. It is filed under Music News/Info. You can follow any responses to this entry through the RSS 2.0 feed.